In Sunday's broadcast of Mann ki Baat, Prime Minister Narendra Modi stressed on the need for India to move towards a cashless society through the Jan Dhan, Aadhaar and mobile phone trinity. He said that this would make transactions transparent and reduce black money in the system. The Prime Minister also underlined the need to protect forests and water resources, gave an account of the measures taken by the Centre and state governments to meet the challenge of the drought and appealed to people to launch a Save Water Campaign during the monsoon months from June to September. Modi said there was a need to make transactions ‘transparent’ in India, and for that to happen people need to shed some old bad habits. "We were taught in school about a time when there were no coins and currency notes but barter system. “Gradually, coins and currency notes appeared. “But now the world is moving towards a cashless society with the help of technology," the PM said. He said this might look difficult in the beginning but becomes easy with frequent use. He said nearly every Indian family now had a Jan Dhan bank account; nearly each Indian had an Aadhaar number and a mobile phone. The PM detailed the advantages of a cashless society. "With Jan Dhan, Aadhar and mobile or 'JAM' we can move towards a cashless society," he said. He said the RuPay card given to each Jan Dhan account holder will soon be useful for both credit and debit transactions through Point of Sale. The other initiative being worked upon is 'Bank on Mobile', the universal payment interface banking transaction that will make money transfer through phone very easy. He said the National Payments Corporation of India and banks are working towards launching this platform as a mobile app. The PM said post offices are also starting banking services. "If all of us adopt this then we won't need cash or currency. “It will be a dent on underhand dealings in business. 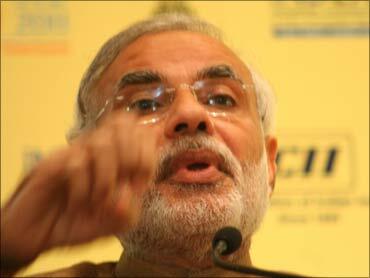 There will be transparency, influence of black money will lessen," he said. The PM expressed concern at the continuing heat wave and drought. He said the news that monsoon may arrive a week late was of concern. Modi said humans themselves were to blame for this and by indiscriminate deforestation people have paved the way for their own destruction. He said on the forthcoming World Environment Day on June 5, the country needs to discuss about conserving water and tree cover. Modi said he has held detailed meetings with 11 drought-affected states — Uttar Pradesh, Rajasthan, Gujarat, Maharashtra, Madhya Pradesh, Chhattisgarh, Jharkhand, Karnataka, Andhra Pradesh, Telangana and Odisha. “As has been the government tradition, I could have had one meeting, but I met them individually for two-and-a half hours and heard in detail what states had to say,” Modi said. He said normally such discussions are about how much money was sent from the Centre and spent by the states. “But we heard the measures taken by the states and this was a surprise for our bureaucrats as well because several states have done commendable work to meet the challenge of drought,” he said. Modi said he had asked Niti Aayog to cull some of the best practices and implement these in all states. He said an adoption of per drop-more crop, micro-irrigation, drip-irrigation and sprinkler system has helped in saving water. He said some states have employed drip irrigation even for paddy cultivation, which has resulted in increased yields and saving of labour. The Prime Minister said Maharashtra, Andhra Pradesh and Gujarat have targeted that each year 200,000-300,000 hectares are added to micro-irrigation. He also spoke about the various programmes launched by state governments, including Madhya Pradesh's Balaram Talab Yojana where 22,000 ponds have been dug and efforts to revive old wells in Karnataka. He said people should save water in the months of June, July, August and September. “This time when we celebrate Diwali it should be a source of joy to us that we saved water,” the PM said. He said the next four months (June to September) should be observed as Save Water Campaign. He said saving water was not just the responsibility of governments, politicians but people at large and that media should help in telling people how to save water. The PM also lauded outgoing Sports Minister Sarbananda Sonowal, who is to be sworn in as the next Chief Minister of Assam, for visiting the sports institute in Patiala to inquire about the preparations of athletes for the Rio Olympics and whether they were getting proper food and training.